Making the decision to eat wholesome food is the first step towards becoming healthier. When you get rid of processed foods riddled with unhealthy fats and sugars from your diet, you can drastically improve the functions of your system and boost your health. Admittedly, living a healthy lifestyle by preparing nutritious meals can be difficult and time-confusing. But with the right tools though, you can keep up with this lifestyle, prepare yourself a week’s worth of nutritious meals and see great results. One of the tools you need in your kitchen to help you in your health goals is the vegetable steamer. In this article you will learn more about the delicate cooking art of steaming and which of the food and vegetable steamers out there are worth buying. We will guide you in making the right choice, so you never have to run out of healthy food ever again. There are many cooking methods out there but none as effective in preserving the nutrients in it quite like steaming. Steaming is the perfect way to get more out of your vegetables as it effectively softens the vegetables but without damaging the nutrients. These are the nutrients that will otherwise be lost or damaged during more aggressive cooking methods such as frying or boiling. Additionally, you can also enjoy the texture of vegetables more when they are steamed as they remain crunchy. They also retain their vivid color. Vitamin C is one kind of water-soluble vitamin that is indispensable to our good health. It plays a big role when it comes to keeping our immune system up and maintaining the structural integrity of our connective tissues. That means if you get sick with the flu, you get infections a lot or you have a wood that is taking such a long time to heal, you need to eat more foods rich in Vitamin C as that will help your immune system and your wound-healing abilities. When adding vegetables such as cauliflower or broccoli, or any other cruciferous vegetable in your diet, see to it that you steam it first. Steaming these vegetables at very low temperatures with only a small amount of water can help in preserving their natural cancer-fighting properties such as glucosinolates. This is a compound that helps in inhibiting the formation of tumors and also prevents damages to the cells brought about by carcinogenic compounds in the body. This is another vitamin that you can abundantly get from vegetables and will be preserved through the steaming process. You can get this from bright-colored vegetables such as squash and carrots. What makes this vitamin so essential is its ability to boost the immune system. When combined with other nutrients such as potassium, B complex and vitamin C, they work together in maintaining healthy blood pressure. Of course, there are a lot of other nutrients out there preserved by the steaming process. You just need to have a varied diet. Be careful when steaming your vegetables, especially the green leafy ones, so they do not get overly done. Steam your vegetables without worries with the help of this electric steamer that features 3-tier stackable baskets. Each basket is transparent and free from BPA. With its 9.5 quarts or 9L of cooking capacity, you should be able to steam more vegetables and other types of food in one go. It also steams fast as it generates steady steam in as fast as 40 seconds. It has a water detection system where it turns off automatically when it detects that the water receptacle is empty. You can also see through its water level indicator whether there is still enough water. If you need to add more, a water-fill inlet found on both sides of the steamer is there for you to conveniently do so. This unit has a big steaming capacity. It is ideal for people who do a lot of steaming at home for their big family. There is a timer that automatically shuts off the steamer once the water dries up. The baskets are see-through, so you can see if your food is being cooked or not. The water level indicator is a nifty feature as it lets you see if you have run out of water. You can easily control how long the steaming process will go. The knob at the center is easy to use. There are water inlets on both sides to allow you to fill it up with water with ease. It comes with additional accessories such as a rice bowl and built-in egg holders. Some said it takes longer to steam food. 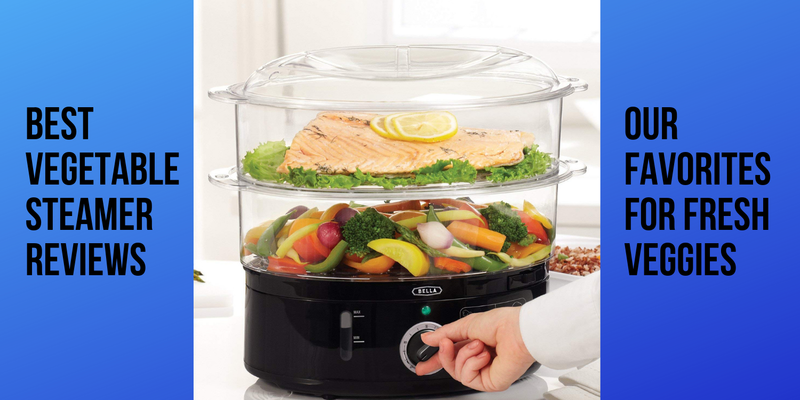 This electric steamer can accommodate 7.4 quarts of food. With its 2-tier design, you can cook different kinds of vegetables in it. Set the timer and you are good to go. It has an auto shut off feature and a boil dry protection to ensure seamless and safe cooking. In as fast as 30 seconds, this steamer produces a good amount of steam already. It has a good capacity for small to moderate steaming needs. The 2-tier design works in cooking a complete meal. You can steam meat in one tray and vegetables in the other. It will save you a lot of time. The controls are easy to use. It also has a steaming chart to guide you in finding the perfect time for steaming your food. It has a view window for water level. The steaming containers are easy to clean and are dishwasher safe. The baskets have an order. They can’t be used interchangeably. This high-end steamer will last you for a long time. It has a nice 5L capacity that should be able to accommodate most people’s steaming needs. The steaming pot is made from a sturdy glass material that can be cleaned in the dishwasher. You can easily control it with its LCD control panel that also features an audible alert function. You can manually set the timer or use any of its pre-programmed settings. The water reservoir has a big 1L capacity. Beautifully designed vegetable steamer. You will love to showcase it in your kitchen. It has a mid-size capacity that works for most families. It already comes with pre-programmed settings. The audible alert lets you know when your food is ready. It is a cinch to use. All the materials used in this are safe. No worries that chemicals will leech on your food. Can take up a lot of counter space. If you prefer the classic way of steaming your vegetables, get this. It features aluminum core and stainless-steel surround material that evenly distributes heat. It is a great product that you can use even in the oven as it can handle up to 350 degrees Fahrenheit of heat. When not using it as a steamer, you can use the pot for your other cooking needs. It is a versatile cooking tool. It is made from heavy-duty materials. This will last you for a long time. Easy to clean and maintain. Just stick it in the dishwasher. It doesn’t take up too much space during storage. You can load it up with a lot of veggies. Affordable and easy on the budget. You need to keep an eye on the steaming process to avoid over-steaming. Now which of these products is the best choice for you? 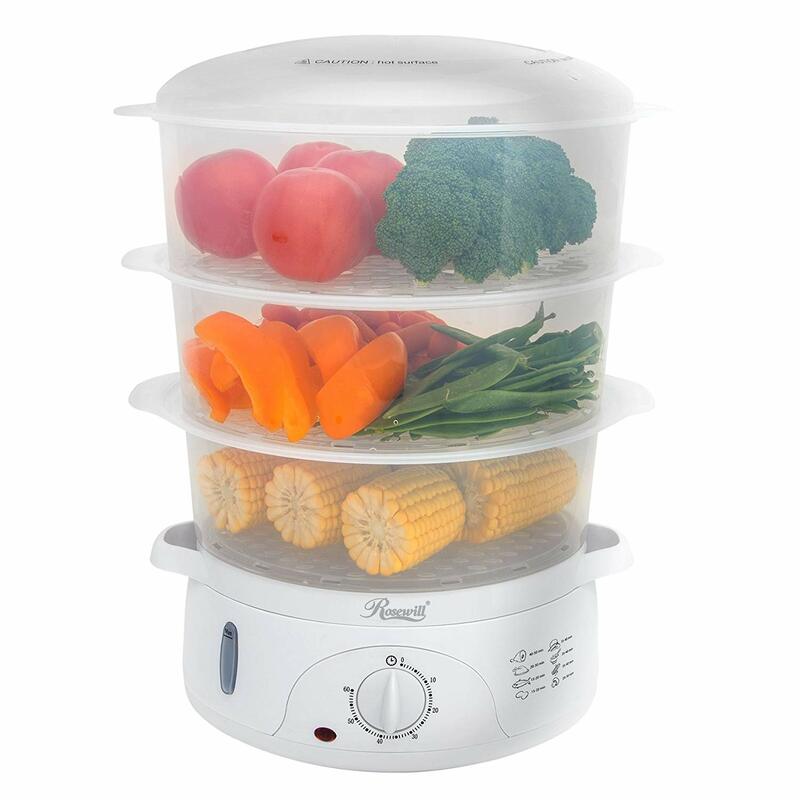 Best for Big Families or Meal Prepping: Rosewill Electric Food Steamer 9.5 Quart Vegetable Steamer. Do you steam one big batch of vegetables to last you an entire week or do you often make food for more than 5 members of the family? Get this one then. It has a large capacity that will surely accommodate your needs. Compact Choice: Bella 7.4 Quart 2-Tier Stackable Baskets Healthy Food Steamer. 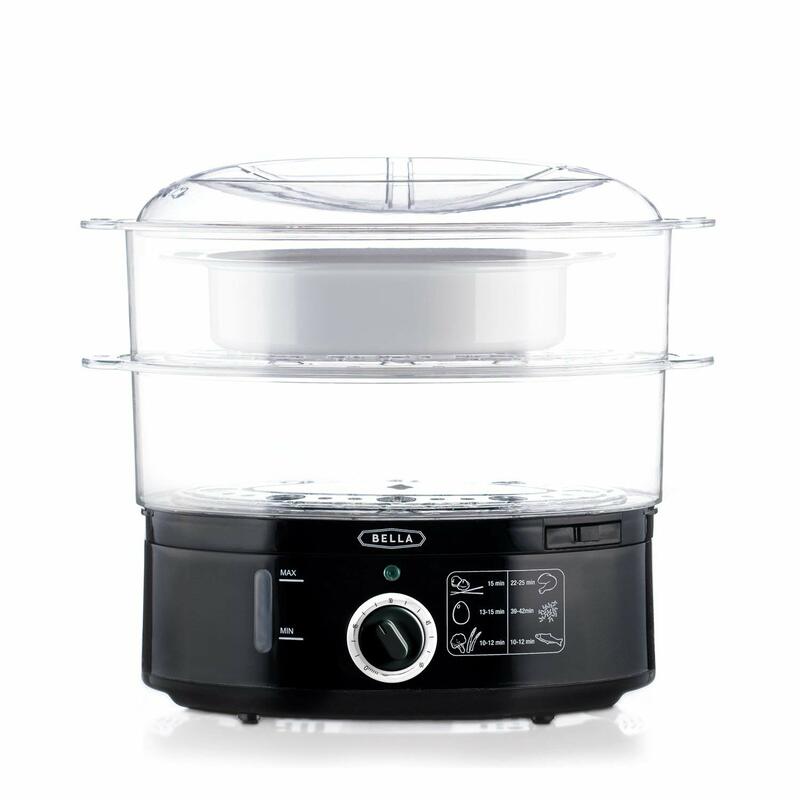 This food steamer is what you should get if you have small to moderate steaming needs. It has a nice compact size that works in smaller kitchens as well. Safest Material: Cuisinart STM-1000 Digital Glass Steamer. If you are concerned about using plastic, get this one. The tray is made from glass. Extra care is needed when using it though and you might have to give up more counter space but over-all, this is a solid glass steamer to get. 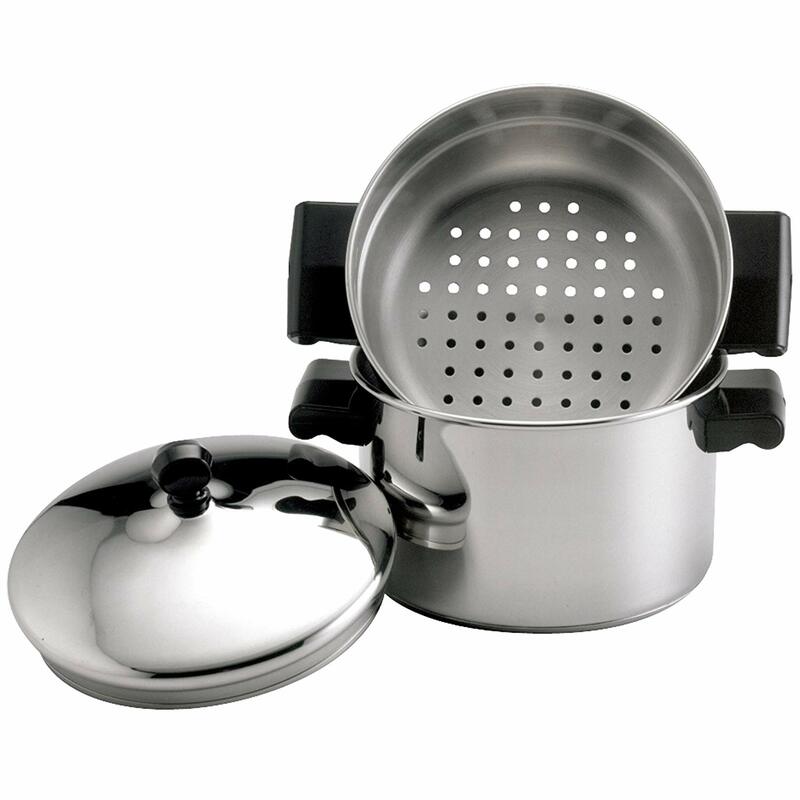 For Small Steaming Needs: Farberware Classic Stainless Steel 3-Quart Covered Stack ‘n’ Steam Saucepot and Steamer. Don’t like the idea of maintaining an electric steamer because you only need to use the steamer occasionally? Get this one then. It has a good capacity for small to medium steaming needs but doesn’t require too much maintenance work. Choose the type of steamer that works for your preferences. There are various types of steamers out there. There are the basket steamers that folds down or opens up to accommodate different varieties of vegetables. You place these in a pot full of water and the steam from the boiling water will get in the vegetables and cook them. While it is good for quick steaming, it doesn’t have enough space for a lot of vegetables, so if you are meal prepping, this might not be the best choice. Another option is the sauce pot and steamer combo. It is a sauce pot that comes with its own steaming basket. This usually accommodates more vegetables. It is also more convenient to use because the steaming basket fits the pot well and you can just simply take the basket out without worrying about spills. However, you have to keep an eye out for it because vegetables can end up getting overly steamed if you leave them steaming for a long time. Electric steamers are also ideal options. They usually come in stackable layers of baskets. What is great about this is that you can separate your vegetables in different stacks. You can place the vegetables that cook longest at the bottom and the more delicate vegetables at the top. 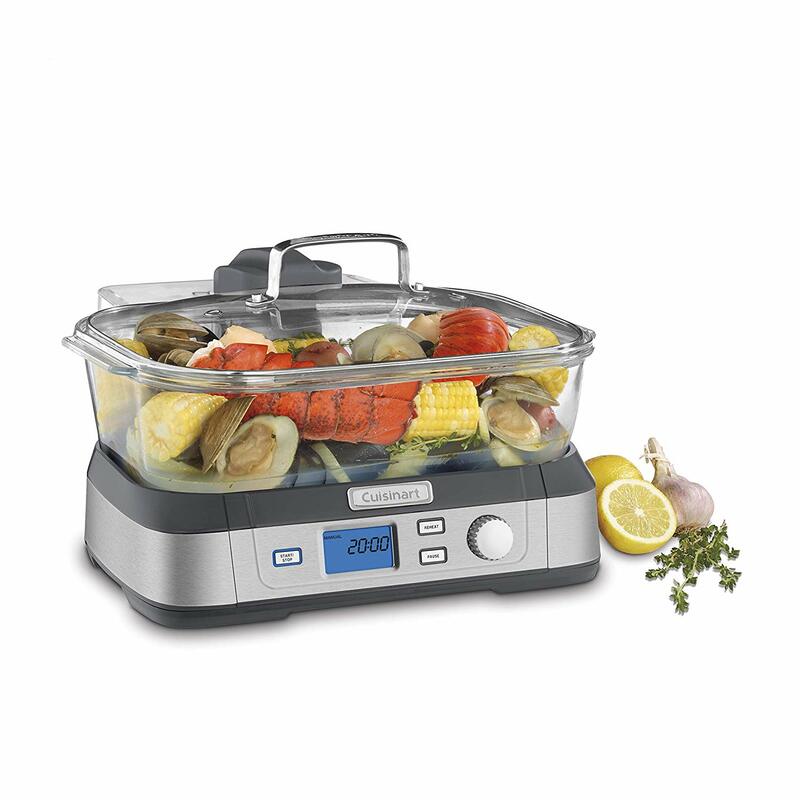 You can also set it to your preferred steaming time, which helps reduce instances of over steaming your vegetables. If you more money to spare, spring for this type of steamer as it has the best features and benefits. Go for the steamer with the capacity that will work for you. Do you plan on steaming a week’s worth of veggies? Get something with more capacity then. Determine how much steaming you need to do, so you can decide which of those in the market today will provide you with the benefits you are looking for. Make sure it doesn’t contain harmful chemicals or other additives. The materials used to make the steamer should be devoid of anything that can leech on your food such as BPA. This is true, especially when buying those see-through basket steamers. Find out if it is dishwasher safe. Maintenance should be a cinch, so find out if it can be washed easily. Ideally, you would want to go for one that is dishwasher safe for added convenience. Does it include other accessories? Additional accessories such as a rice bowl or an egg steaming tray can come handy. Keep these buying tips in mind, so you will be able to find a good vegetable steamer suitable for your needs. Head to our homepage for some more reviews and product recommendations. You need to make sure you are getting only the best for your kitchen.